So. Are you gonna ride? As excited as I’ve been about Thunderbird ever since I was invited into the “cone of silence” 18 months ago, the thought of riding it was, frankly, incomprehensible to me. You see, I have a long history of complicated relationships with rides. It started when I was just three years old. My family lived in Connecticut at the time and we visited Quassy Amusement Park (then called Lake Quassapaug) for the day. There was this incredible attraction – a helicopter ride – that I was determined to ride. Looking back now, I realize it was a kiddie ride, but back then it was the hugest, most daunting ride out there. “Are you sure?” My parents knew me well enough to ask this and I stubbornly insisted it was the only ride that mattered to me. And so they tucked me into my own little helicopter and started up the ride. Only thing is, no one mentioned that clutching the bar and pulling it down toward me would make my helicopter soar into the upper stratosphere. So much that they stopped the ride mid-cycle and let me off, still screaming. A bunch of us from Carmel High School convinced our parents to let us take a day trip. First stop at the big Cincinnati park: The Racer. Once again, I was overcome with an uncontrollable need to scream. Something in my psyche trips a switch, telling me the only way to endure the terror is by wailing from the lift hill to the brake run. The only way. The Racer has two trains. Upon exiting our train, I continued screaming like a banshee, calling to the riders in the second train to reconsider their decision to ride. “It’s terrifying!” My embarrassed friends dragged me away before Security was called. And so, as I’ve told my boss repeatedly, I have no business working at a theme park. The thing is, I’m a very bad rider. I don’t relax and let the train carry me away. I clench and grip. And scream. Twenty years ago, I rode the brand-new Raven with a reporter and grabbed her lap bar as well as my own. It’s not a safety thing – I know the people who build and maintain our rides. They ride them, too – and bring their families. Is it a height thing? Sure. An “I’m not in control” thing? Oh, probably. It’s definitely a scream thing. But, being in the position I hold here, it wouldn’t feel right for me not to ride Thunderbird. How could I describe it here on the HoliBlog, on our website, in conversations with reporters, with only hearsay to guide me? And so, during our staff breakfast yesterday morning (thank you, Lori! ), when Matt announced we could ride at 3pm, my heart skipped a beat. Joy filled the room and nearly everyone cheered. Angie in Guest Services beamed like never before and our Attractions management team grinned from ear to ear. By three o’clock, I still hadn’t decided. I told Matt, “You know, I was working on the ride-announcement scripts today and now that I’ve read through them, I think I may have developed all the warning signs – a crick in my neck, a touch of high blood pressure – and you know, I just might be pregnant!” He laughed a little too hard at that last part. I’m a grandma, after all. After working the crowd and watching Dee Ann and Vanessa overcome their fears and ride, it was time. His face broke into what I can only describe as a look of glee. We clambered on board and the train slide into the launch room. The special effects are incredible. A simulated storm, complete with fog and rolling, then crackling thunder. Who has time to scream when you go from zero to 60 in just over three seconds? It was incredible. I continued my terrible riding habits by not only screaming throughout, but also riding with my eyes closed. Tightly. Whoa! Upside down – and again! I’ve studied Thunderbird’s layout and construction process well enough to know what was happening and what was ahead. The fly-through barn. That’s still ahead. And we go through it twice. I must say, it’s incredibly smooth. And non-stop thrilling. And comfortable. Really comfortable. Even when you’re upside down. Which happens four times, have I mentioned? “No way! That was Eric!” I hollered back. My cracking voice betrayed me, though. I’d blown my pipes. As Thunderbird slid back into the station, Eric hopped off his seat, with a grin the size of our Immelmann loop. Still in my seat, still clutching the restraints, I had to admit: It was. Tell me someone got a video of this! RavenMaven no more you’ve graduated to ThunderbirdGrandma! Awesome commentary!!! 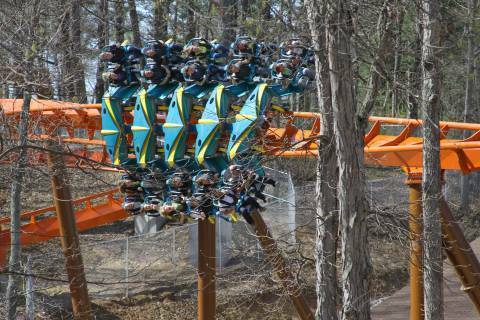 I have been following the blogs every day and I can’t wait to ride the thunderbird!!! I am more scared of flying to Indiana than riding the thunderbird….I think!!!! Hilarious and wonderful Confession!!! I laughed all the way through—mostly because I’m a grandma and that’s how I USED to ride when I first became a rider of roller coasters! As a grandma! First ride ever was on the Raven 11 or 12 years ago. How quickly that became a screamless roller coaster love affair!!! SOoooo looking forward to hopping aboard the Thunderbird next weekend and it can scream all it wants to!!! Steel coasters are so smooth. This coaster will put your park on a level you would not have imagined. Thunderbird is your game changer. I look forward to visiting this year after skipping the last 2 years. I didn’t forsake you though. I send my daughter and her season pass every year! Paula, great post! I’ve been so excited about this ride since the “fun” last year, and this just makes it better! Can’t wait to get on! So Grandma caught the “Tail of The Bird” ? IS this a fishing story? There is a Lake Rudolf nearby. WHere is the film… at Eleven? Grandma screams in terror …. of fun ! Way to go, Paula! Maybe you’ll ride again with us at Holiwood Nights.